In this sketchup v-ray video tutorial, demonstration is given on new V-Ray 3.6 for SketchUp. V-Ray 3.6 for SketchUp comprises of some advanced features like fast-paced GPU rendering, smart hybrid rendering, a efficient UI, viewport rendering, VRscans support, and lots other. V-Ray 3.6 for SketchUp now supports sketchup 2018. VIEWPORT RENDERING: New viewport rendering facilitates the users to simply choose and render several regions simultaneously, and instantly intermingle among V-Ray render and SketchUp model with +/- hotkeys to manage opacity. STRONG GPU RENDERING: Rapid, more strong GPU rendering with additional support for aerial perspective, displacement, subsurface scattering, matte/shadows, and more. HYBRID GPU+CPU RENDERING: With V-Ray GPU running on NVIDIA CUDA, the users can reap the complete benefit of all existing hardware along with CPUs and GPUs. ADAPTIVE LIGHTS: For scenes which contain adequate lights, the new Adaptive Lights mode can allow minimizing render times by up to 700%. SMART UI: The complete V-Ray for SketchUp interface now becomes cleaner and easier, with superior support for 4K monitors. FILE MANAGER: Organize all of your scene files under one position. Arrange file paths, form scene archives, and monitor assets like textures, IES files, and proxy objects. V-RAY COLOR PICKER: With the addition of new color picker, it makes it possible to choose color values in Screen sRGB (0–255) or Rendering (0.0–1.0) color space. To view online demonstration of V-Ray 3.6 for SketchUp, watch the following video tutorial from Chaos Group. Maciej F is the developer of the newest sketchup plugin alias VR Sketch. It is well matched with sketchup 2017 and sketchup 2018. It is only compatible with windows platform. The trial version of the plugin functions for 2 weeks. After that a paid version is required with free access for 2 weeks. The current version allows the users to view and edit directly in VR and the users can use it to deal with large models. The link from SketchUp files is instant and it is possible to edit both on the monitor and in the VR simultaneously. The present version is not intended for photo realism and rather features on having a cartoonish but well performing mode that allows you to edit SketchUp files 100s of megabytes in size. Abvent S.A. has recently introduced Artlantis 7, the most updated version of its robust 3D visualization software that is specifically designed for architects and designers. Artlantis 7 comes up with various new features which can enhance the calculation speed and rendering precision. Besides, this newest version launches Twinlinker, an application that empowers the users to quickly generate and distribute virtual visits of their Artlantis and Twinmotion projects online. Superior artificial lights: With the accurate artificial light sampling method, it becomes possible to enhance the energy diffusion of the light sources in the 3D scene and reinforce the reflection of the satin materials by means of a brighter gloss. Adaptative anti-aliasing: Powerful anti-aliasing facilitates the users to locate the areas to be rendered, optimizing calculation and curtailing rendering times, devoid of any modification in the image quality. Twinlinker: The virtual visits app is created by Abvent R&D. It facilitates the users to generate and distribute virtual visits of their Artlantis and Twinmotion projects online quickly and easily. Just export the images, panoramas and videos produced in Artlantis 7 to Twinlinker, then connect them to develop virtual visits. These can be distributed extensively by email (a simple link) or made available for screening on a website. Jeff Branch: Jeff Branch is a hobbyist woodworker, carpenter and blogger, who have been working as full-time in the flooring industry to build furniture for about 30 years in his home based workshop, Pelham, Alabama at USA. He has done his graduation from the University of Alabama with a BA in Communication; he has worked in the flooring industry holding both the positions of sales and sales management. After that he has changed his job and recently working as a manufacturer’s representative selling residential and commercial flooring products to retail flooring stores and commercial sub-contractors in central Alabama. He has started woodworking at the classes of his university and complete many projects on a commission basis; he has made fourteen woodworking plans till now where he uses SketchUp for illustrating and modeling his works. He prefers to work with SketchUp Make and Pro and has created many SketchUp models also. Everyone is aware about Jeff’s awesome models in SketchUp which he used to make before doing any kind of Woodwork design but according to him all of his works are of same pattern so there is not a new thing for him. but he always has desires to do something new in SketchUp and whenever he gets a chance to do an out of track work he gives his full attention and on some occasions he also does free SketchUp work which can define his skills in a new way. In this article we are going to discuss about three new completed SketchUp projects which Jeff has finished recently and he has shared his experience working in a new way. • The AWG Workstation: Recently the Guild has told Jeff to create a SketchUp model for a new workstation which should be a combination of downdraft sanding station, router table and miter saw stand. After creating a simple model in SketchUp, Jeff found an error and used a new method to find it; at first he has created the cutlist for the workstation where a component was showing in the wrong dimension which he could not find in the SketchUp model. There is a rarely used tool in SketchUp called the “Outliner” found in the following path Window > Default Tray > Outliner; it shows a list of the components in a model. By clicking a component from the list the component will be highlighted in the model and Outliner helped him to find out this mystery component and fixed the model. So basically in this project, Jeff created the SketchUp model based on a design by member Patrick Bush and then made basic images and a cutlist to show the measure of the material in the project. • The Curio Cabinet: The Jackson Dresser woodworking plan was started off from an email request made by a reader for a particular curio cabinet and as it was a long process, he just made only one. Though he has made a SketchUp model for the reader and arranged scenes showing the method of making it. While making the broad curve of the legs, Jeff was facing some problems in the radius of the curve changes along its length so he tried a new tool named Match Photo from the Camera drop down menu. This tool imported the curio cabinet photo and then aligns each axis to the photo; next he traced over the photo with the line tool and Bezier curve extension to make a duplicate leg. • Arts and Crafts Side Table: At first he took a standard quarter-sawn white oak and piled the color in Photoshop with two standard filters and warmed up the color a little bit. It gave the model a shiny look and made it a little different from the picture. Inventory3D for Excel is the newest sketchup plugin that is compatible with SketchUp 2016, SketchUp 2017, SketchUp 2018. It is a paid plugin. The plugin can be used to allow three-dimensional graphical inventory, design and facilities maintenance with Excel spreadsheets. 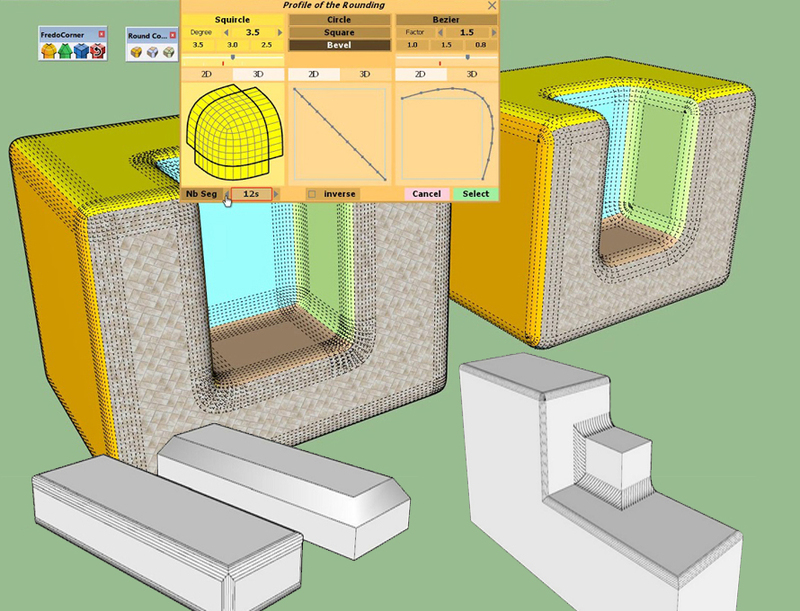 Autolayer – It can organize the layer structure of the SketchUp components in relation to their SU_Layer column values in Excel. Autobinding – It can automatically unite components in the model to Excel records with their unique identifiers/names. Autopositioning – It can automatically arrange components in the model in accordance with their coordinates described in Excel. Assisted Labeling – It can demonstrate excel information regarding components in SketchUp Layout.